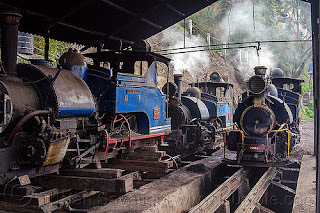 A Unesco team that is working on a conservation plan for the Darjeeling Himalayan Railway today said it had got feedback that the toy train service did not meet the criteria to command heritage status and was close to being put on the "danger list". Paul Atkins, the technical consultant of Unesco, who is part of the team drawing up a comprehensive conservation management plan, said the plan "was to have been drawn up within five years of the Unesco granting world heritage status". He said it was delayed for various reasons and the two-year project had started from March this year. The Unesco granted world heritage status to the Darjeeling Himalayan Railway on December 2, 1999. Today, the DHR marked 136 years of operation. On August 23, 1880, the first train ran from Siliguri to Kurseong. If the DHR is put on the List of World Heritage Sites in Danger, it will share space with the ruined archaeological remains of the Bamiyan valley in Afghanistan, where the Taliban destroyed two statues of the Buddha in 2001. Also on the list is Aleppo in Syria, where a multinational military effort to counter the Islamic State has made the ancient city a war zone. Atkins today said: "In the past, the Unesco had received feedback from unofficial people but who are experts in their fields that the DHR was not meeting the criteria. Unesco had raised the matter with the Indian railways and following their assurance, it decided not to put them on the danger list. Right now, it is not on the danger list but it is getting closer." Atkins said the DHR should have a separate management structure. "The DHR needs an independent management unit, which along with railways should incorporate local stakeholders and civil administration. The DHR also needs special maintenance and people with special skills and knowledge of the system and this has to be passed down," he said. The Unesco team believes that following the conservation plan would lead to setting up a DHR world heritage site management office. "Excessive encroachment, illegal structures dangerously close to the tracks, loss of physical features of the DHR over the years and restructuring of the work forces are some of the challenges," Atkins said.